"The best thing you can do is find a person who loves you for exactly what you are." 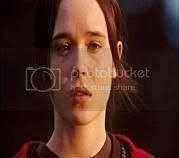 Juno (2007), directed by Jason Reitman (In God We Trust, Thank You for Smoking) and written by ex-stripper/blogger Diablo Cody, starts with Juno MacGuff, played by Ellen Page (Hard Candy, Mouth to Mouth, An American Crime), walking to a drugstore in a small suburb of Minnesota while drinking a gallon of Sunny Delight juice. She is a 16-year-old burn-out who was named Juno after Zeus’s wife: "She was supposed to be really beautiful but really mean. Like Diana Ross." Juno uses a particular slang with frequent private jokes, allusions to pop culture and to her preferred indie low-fi bands. After a first sexual encounter with her best friend, track runner Paulie Bleeker (Michael Cera, Arrested Development, Superbad), she thinks she might be pregnant, so she takes three pregnancy tests under the sarcastic eye of the clerk, Rollo (Rainn Wilson) who makes a series of inappropriate remarks like, "So what’s the prognosis, Fertile Myrtle?" When she discovers she's actually pregnant she goes to Paulie's home to give him the news; he reacts predictably, scared about Juno's future decision. His character will appear intermittently throughout the film, always as a loyal, if at times paralyzed, lovable nerd who adores Juno unconditionally, despite of her defiant attitude. And this is a type of role that we are accustomed to seeing in quirky American dramedies lately, a pattern in which atypical male lead and supporting characters are usually written, versus the Hollywood winner-jock-smartass prototype. In fact, in Juno the only jock who intervenes, Steve Rendazo (Daniel Clark), just serves as a device to make us despise the hypocrisy of the popular cliqués of high school: "Funny thing is that he secretly wants me. Jocks like him always want freaky girls. Girls with horn-rimmed glasses and vegan footwear and Goth makeup." Juno's voice-over continues to reveal to us the understated fascination that popular guys have with loser eccentric girls: "They just won’t admit it, because they’re supposed to be into perfect cheerleaders like Leah." Leah (Olivia Thirlby) is her slightly ditzy blonde friend, completely supportive of Juno when she's needed. Su-Chin: I heard that was you. Juno decides not to interrupt her pregnancy and instead she begins to look for a suitable couple to raise her future child, reading the classified ads in the Penny Saver. Juno chooses a wealthy couple, Mark Loring (Jason Bateman) and his wife Vanessa (Jennifer Garner), who live in upper suburban St. Cloud and they show Juno great hospitality and support, Juno reacting at the most embarrasing moments as usual, spouting snappy dialogue to relieve the tensions. Beneath this yuppie, ginseng-infusion drinking marriage, Juno will discover the reverse side of conjugal happiness between Mark and Vanessa, differences that deepen with Juno's arrival in their lives, as she shares maternity chats with Vanessa and bull sessions with Mark, where they make snobby references to gore cinema and discuss the peak of punk, indie music vs. music for ads, and Les Paul Gibson vs. Fender guitars. The film's soundtrack is mostly an off-beat collection of Kimya Dawson and her band The Moldy Peaches, plus The Velvet Underground, Cat Power, and oldies from Buddy Holly, The Kinks, and Mott the Hoople. Obviously impressed by Mark's rock culture knowledge, Juno pushes Paulie away from her adventures, encouraging him to go with another girl ("Soupy Sales") to prom. It's a sad time for them both, as they must reevaluate the dynamics and meaning of their relationship; fortunately in the last act of the film we'll witness the real Juno under her "hipster than thou" mask. Reitman's film is successful in exploring an oddball juvenile world from a different angle than most mainstream productions, but the small, sour and sweet details aren't excluded here.